Whether you use scrum, kanban or something in between you'll rely most likely on user stories. 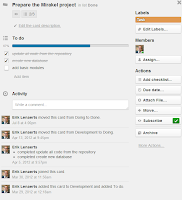 for this I'm using Trello. 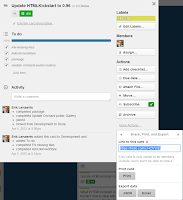 The basic idea of Trello is to organise "cards" in columns, plain and simple. 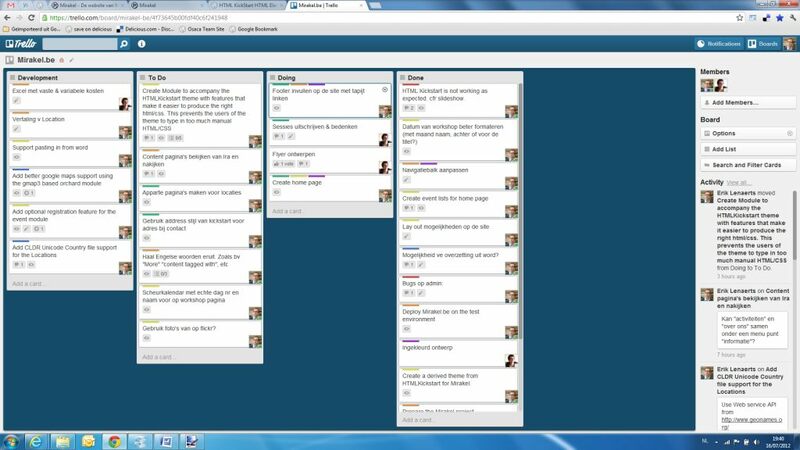 To be honest I don't think you'll need to read any manual to get going with Trello, it's very simple but yet powerful and that's what I like about it. Maybe there's one page you want to read about which is the shortcut page. 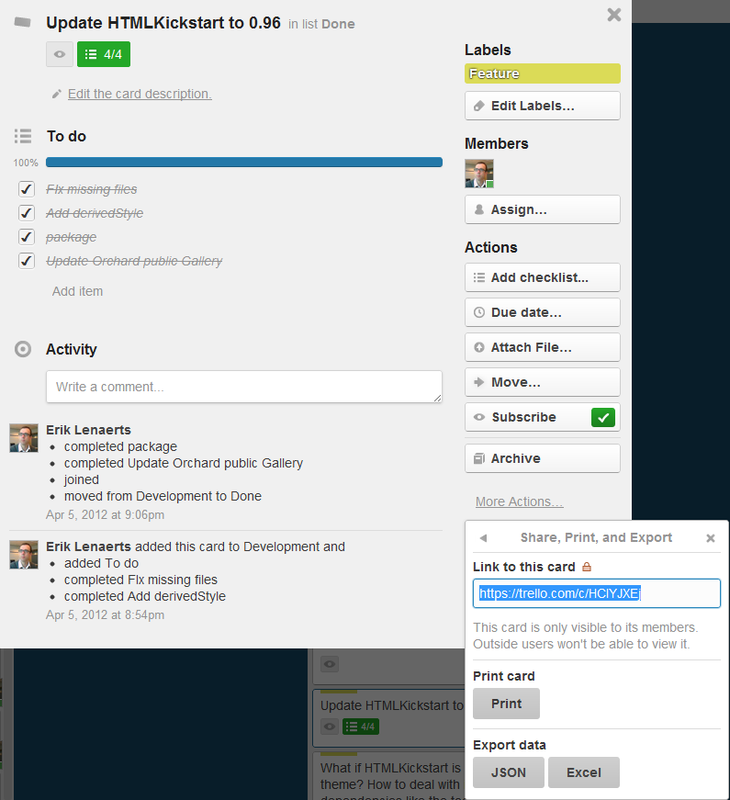 It makes working in Trello much more efficient especially when you're preparing or organising a sprint. You can prioritise cards simply by dragging them to the top. Doing this from a mobile device immediately reflects it on the Trello I have open in my browser. By using the check-list on a card (user story for example), you can define smaller tasks and keep track of their completeness. To link cards in you're documents you can use the share feature on the bottom right which automatically create a handy shortened Url. Just now they guys from Trello added integration with Google docs which brings me to the topic document management, but before we do, I would like to point out to a great Kanban approach from the people at UserVoice who wrote an excellent article about it. I'm very glad to see companies share there experience as opposed to keep their "intellectual property" for themselves. It fit's perfectly with the competitor's section of the book REWORK that I read during my recent vacation. I used to work with dropbox, however I changed to google docs a while ago as I feel it is better in the "working together" area. 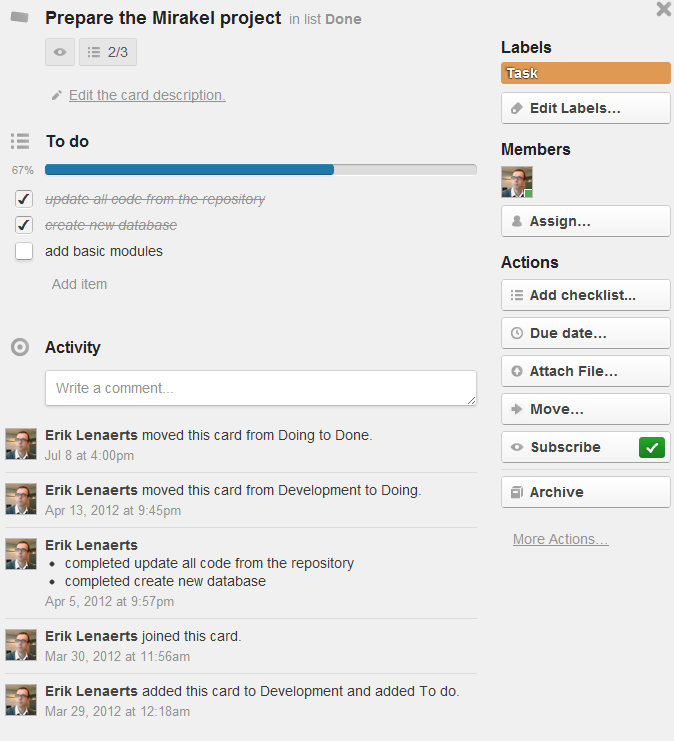 As much as I like the cards of Trello, they can only host a limited amount of information. Analysis documents of any kind are better of in Google docs. I noticed I'm also writing more and more documents inside google docs rather than microsoft word. When the look of the document is more important or when a lot of drawing is involved I go to Microsoft Word. For simple documents I use a document directly in google. For designing screens and ideas I use Balsamiq Mockups, there's both a desktop client as a web version of it that work great together. Before when doing design, I sometimes made actual mockup code that rendered actuals screens, however some people were always confused and didn't understood the difference between a mockup and a finished product. With balsamiq, the difference is clear as the mockups are based on similated handwritten texts and images, no mistakes here.